Christmas is the time of year for excess, especially when it comes to consuming foods and drinks that are high in sugar. Dentist in Aloha, OR Dr. Jay Slater and his team at Slater Family Dental encourage patients of all ages to focus on giving Christmas gifts that will save time, money and your smile! There are a wide range of gifts that are easy to find and purchase for right around $10. These can show your appreciation without adding an excess of sugar or spending during this chaotic time of year. The scent of evergreen, among others, is one of the hallmarks of the holiday season. One of the ways to bring the holiday “tree” smell into a home is with a Christmas wreath. Many groups in the community sell these all-natural and beautiful wreaths for right around $10, and people love to receive them as Christmas gifts. Plus, there’s no mess once the holidays are over! Instead of a giant tree to recycle, there’s a lightweight, simple wreath. Another option for giving holiday scents is through high-quality, well-made candles. These come in a variety of sizes and scents for the season, including evergreen, cinnamon, cranberry, and cookie varieties. Use coupons or available discounts to get these at great prices from companies like Yankee Candle or Origins and give them as gifts. For many of us, Christmas can be a dreary time of year. Sometimes we become overwhelmed by all that we have to do for the season, and the gloomy winter weather doesn’t help our moods. Consider giving someone special a splash of color to brighten things up, like a poinsettia or a Christmas cactus. Regardless of which one you choose to give as a Christmas gift, they are both beautiful, easy to care for, and add much-needed color to the season. Bouquets aren’t just for flowers, although one might be nice as a Christmas gift for someone special. Over the years, bouquets of fresh fruit, cookies and cake pops have become increasingly popular. These kinds of bouquets, however, aren’t great for your smile. Instead of using items that are high in sugar, consider making a bouquet similar to the one pictured above. 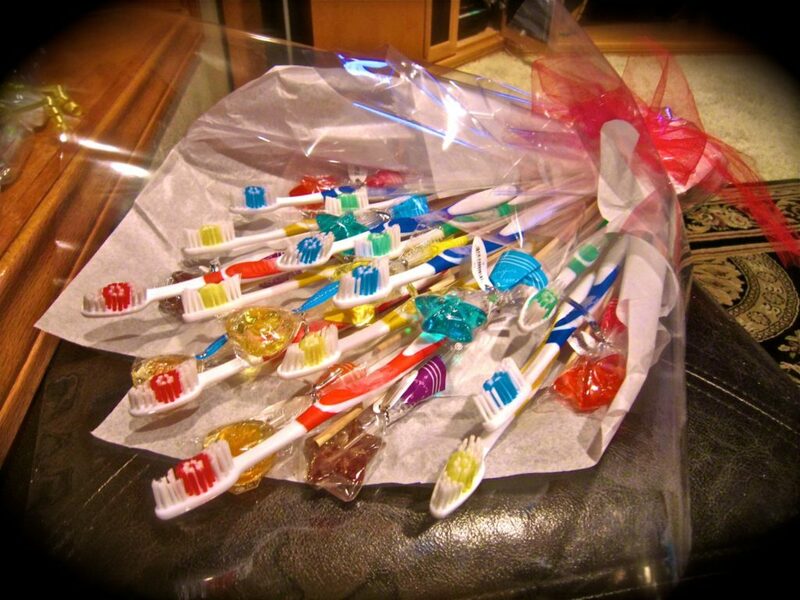 Colorful toothbrushes combined with candy made from xylitol can make a bright and cheery gift, especially for a large family. Add fun flavors of toothpaste and dental floss for some variety, or consider putting in cartoon-themed items for younger kids. Give yourself the Christmas gift of good dental care before the season is over! Call dentist in Beaverton Dr. Slaterat 503-536-1839 today to schedule an appointment with Slater Family Dental.